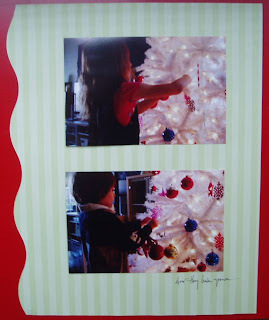 So, crazy woman that I am, I decided to add TWO dailies to my holiday experience this year. I have season two of the December Daily album (about twice the size of last year's) and also the Journal Your Christmas art journal. 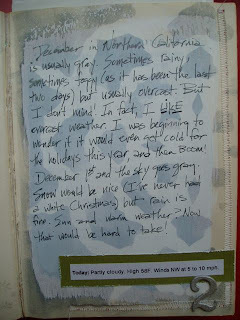 Day One of the art journal was your personal manifesto for keeping the book, and day two was simply the weather. I'm still lovin' the masks and stencils right now, so the background for Day One was gesso through sequin waste (and I used my finger to paint it! As my student's know, I like the fast and lazy way of getting things done!) and for Day Two, I used a hand cut paper snowflake as a mask. The Weathered Wood Distress Ink was the same color as the sky today. Even though the December Daily album is much bigger this year, I have vowed to keep the pages simple. I want to focus on the story, and not take too much time away from the holiday to-do list to complete it. The Day One page is a total scraplift from Ali. 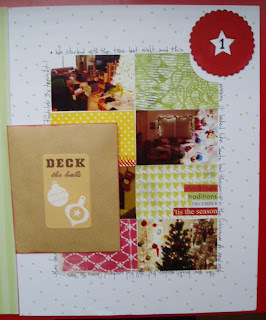 I plan on using lots of page maps and scraplifts to get this one done this year. Day Two has been a day - lots of not so great stuff going on today, and my little camera finally gave out, so it's all journaling. Not much to look at (so I didn't post it). At least it's Day Two and I'm still caught up! Wow... I am impressed, I can just cope with doing the JYC let alone ali's as well! 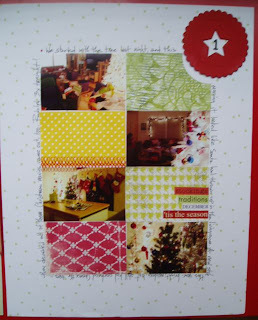 Love the art journal style too! 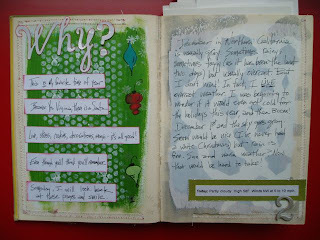 Love the Art Journal style - just wish I could do it - but it always look s like I just made a mess of my page. Very impressed that you can manage to do 2 albums at once!! 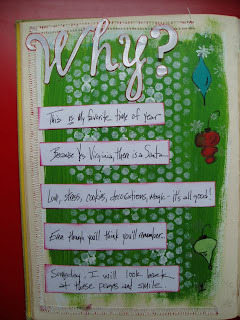 Yeah.. keeping up with Decemeber Daily... beautiful journal casey!